Having a fitness buddy can make a big difference in reaching your weight loss goals. Exercising with friends builds instant motivation and support into your routine. Bonus: It gives you time to catch up with each other. 1. Decide what kind of support and motivation you want. Your BFF might not be your best fitness buddy. You’ll have to get a little choosy if you’re serious about your health. Discuss your goals. Take time to set smart goals that challenge (but don’t overwhelm) you. Compare your goals with those of your potential partner and see whether both of you feel you can support each other all the way to the finish line (and beyond). Consider communication style. A positive attitude is hugely important in sticking with a fitness routine. Make sure you choose a buddy who can ride out the rough patches without resorting to negativity or judgmental language. Be ready for tough love. Staying positive doesn’t mean you’re not supposed to push each other. Agree to be the voice of reason (and good health) especially when the going gets rocky! 2. Get realistic about logistics. You’ll be pushing yourself in your workouts, so there’s no need to make life more difficult by working against conflicting schedules. Obey your body clock. Some people love a morning workout, while others prefer to sweat out the day’s stress after quitting time. If you and your workout buddy don’t share the same body rhythms, make sure you swap the schedule frequently so neither person has to work against nature all the time. Scan your routine for patterns. Is there a coworker or parent in your daycare who always seems to be on the same schedule as you? Even if you’re not close friends, you might make great fitness partners since you can plan around the same daily commitments. Minimize your commute. Don’t forget to factor travel time into your workout. 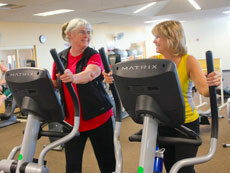 If a favorite gym, class or trail is too far out of range for someone, sticking to a routine could get tricky. Pick somewhere central, or be ready to switch off workout venues to accommodate schedules. 3. Add a little friendly competition to the mix. There’s nothing like a healthy dose of adrenaline to kick a workout into high gear. You can be on the same team while pushing each other to new heights in your routine. Don’t forget the high-fives. Seek out a high performer. Depending on your exercise goals, finding a workout buddy who’s just a little faster and stronger than you can be a great way to take your performance to the next level. Try an online or app fitness tracker. Many apps with calorie and heart rate data also have built-in “social” functions that take the guesswork out of comparing your results. You can “compete” throughout the day, even outside workouts. Build rewards into your routine. If you both reach your monthly goals, treat each other to a sports event, the spa, or a nice dinner. You can also compete against each other by letting the winner “collect” his or her reward from the other person. Make sure to keep things light: Health is the real endgame, here. 4. Incorporate nutrition into your fitness routine. You know the drill: Health isn’t just about burning calories through exercise. It’s about making sure those calories contain the right kind of nutritious fuel for your body. You can make eating well a team sport, too. Trade happy hour for healthy hour. Instead of heading to the pub or café after a long day, meet a colleague or friend for a stress-reducing workout. Pick an activity like jogging or speed walking that will let you catch up while you’re on the move. Take turns bringing healthy post-workout snacks. Bananas and apples are great treats following a class or training session. Or try a mix of almonds and dried fruit. Make sure you replenish all the fluids you lost while exercising with plenty of water. Host a healthy potluck for the group. Challenge your teammates to a healthy cook-off. Assign courses, nutritional requirements (e.g., “Bring something with loads of Vitamin A!”) or just have everyone bring their favorite. The only rule is that it must be healthy. Here are some nutritious noshes to get the ball rolling. 5. Can’t find the perfect fitness pal? Go with the group! You might not find the right teammate right away, but you can still benefit from the social aspect of fitness by taking a Group Exercise class. Who knows—you might wind up meeting your future exercise BFF. Build your own class sampler. With more than 60 class types to choose from at the Y, you can emphasize a specific kind of movement (cardio, strength, stretching, etc.) or just pick something that looks interesting. Classes are drop-in; no registration required. Talk to the instructor before class begins. If you’ve got specific goals for a class, let the instructor know. Especially if you’re new to a class or to an exercise routine, they can help you get the maximum fitness and fun out of the session, and offer helpful pointers throughout. Book a Personal Training session. Our Personal Trainers can give you a fitness assessment, help you define realistic goals, and recommend classes that fit your lifestyle and schedule.